As part of a tour organized by Silver Dagger Book Tours, I recently had the pleasure of reading Murder on Edisto by C. Hope Clark. A dead body is never good for business. And when it is found by vacationing federal investigators Carolina Slade and Wayne Largo while Police Chief Callie Morgan happens to be visiting the newly opened resort, the potential for conflict is no surprise. Especially when it is outside their respective jurisdictions and the local detective is not a nice guy. The author provides the reader with insights into both Callie and Slade, their motivation, their pasts, and their relationships with others. The plot was intricate and well developed, with twists and turns leading to a satisfying resolution and vivid descriptions of a picturesque southern community. An enjoyable mystery. This was my first time reading anything by this author. I liked this book, though I suspect it might be easier to get into for fans of both series who are already acquainted with the two main characters. That said, I just might go back and read the earlier books in those series. FTC Disclosure: I received a review copy of this book as part of this blog tour. This has not affected the content of my review in any way. Click here to enter a Rafflecopter giveaway for a chance to win a $25 Amazon gift card. This month’s “Cozy Happenings” post highlights a few new releases from my author friends from recent months. And if you’re looking for great bargains to fill up your e-reader, check out the Mystery Lovers Virtual Bookshop – all the featured books in the multi-author promotion are free or only 99 cents this weekend only! And there’s also a great collection of 99 cent mysteries to be found as part of the mystery sale over at Fun & Flirty Mysteries this weekend. As part of a blog tour organized by Great Escapes Virtual Book Tours, today’s post features a new release from Tina Kashian – One Feta in the Grave (A Kebab Mystery). After college, Tina worked as a NJ Deputy Attorney General, a patent attorney, and a mechanical engineer. Her law cases inspired an inquiring mind of crime, and since then, Tina has been hooked on mysteries. The Kebab Kitchen Cozy Mystery series launches with Hummus and Homicide, followed by Stabbed in the Baklava and One Feta in the Grave by Kensington Books. Tina still lives in New Jersey with her supportive husband and two young daughters. Please visit http://www.tinakashian.com and join her Newsletter to enter free contests to win books, get delicious recipes, and to learn when her books will be released. Click here to enter a rafflecopter for a chance to win a print or Digital Copy of One Feta in the Grave. For a full list of stops on this tour, click here. As part of a book tour organized by Partners in Crime, I recently had the pleasure of reading Dangerous Flaws by Susan Hunter, the fifth book in this talented author’s Leah Nash Mystery series. This book was a great read. Leah Nash, a likeable, no-nonsense heroine, battles conflicting feelings as she tries to solve a murder – could the man she had once loved be capable of murder? This latest installment in the series has a very intricate plot with two separate murder investigations underway. The red herrings and intriguing twists kept me wondering, and the final resolution came as a surprise. The clues may have been there, but I didn’t see it coming. A fast-paced, interesting and enjoyable read. FTC Disclosure: I received an advance reader copy of this book. This has not affected the content of my review. Click here to enter a rafflecopter for a chance to win an Amazon gift card. Click here to view the full list of stops on the Dangerous Flaws by Susan Hunter Tour. Excerpt from Dangerous Flaws. All rights reserved. This month’s “Cozy Happenings” post highlight some of the new releases, giveaways and bargains from my author friends. Hope it helps you find something great to read. Recent or Upcoming Releases – Check’em Out! And, last but not least – you won’t want to miss out on this cozy mystery sale for a great selection of 99 cent books from your favorite authors. This month’s “Cozy Happenings” posts highlight some of the new releases, giveaways and bargains from my author friends. Hope it helps you find something great to read. And, last but not least – you won’t want to miss out on the Mystery Lover’s Mega Sale for a great selection of free and bargain books from your favorite mystery authors. This month’s “Cozy Happenings” post highlights some of the new releases, giveaways and bargains from my author friends. Hope it helps you find something great to read this summer. Note: This blog does not contain affiliate links. Links are provided for the reader’s convenience only. 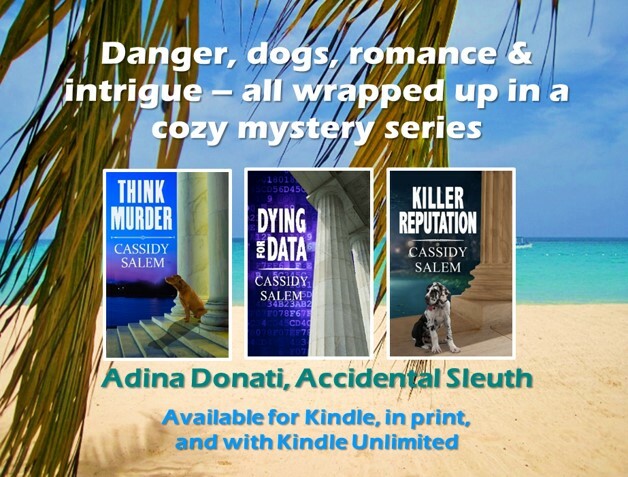 First, my exciting news: Killer Reputation, the third mystery in the Adina Donati, Accidental Sleuth mystery series releases on June 15th and is currently available for pre-order at a special introductory price of 99 cents. And, if you haven’t read it yet, Think Murder, the first in the series, is on sale through June 11 for 99 cents, too. If you are fans of the Hannah and Tamar Mysteries, you can get your copy of Malicious Mischief and The Misplaced Dog for just 99 cents each (limited time offer). The Summer Snoops and Cozy Crimes boxed set is up for pre-order for only 99 cents, with all profits going to support NO KILL animal charities. This month two groups of authors have teamed up to offer great selection of book at special prices. Perfect chance to stock up on cozy reading material for the summer. You’ll find 80+ cozy mysteries on sale for .99 or Free from June 8-10 as part of the Summer Book Bash! And don’t forget to check out the Great Cozy Mystery E-book Deals for more special offers. As part of a Blog Tour organized by Great Escapes Virtual Book Tours, I am happy to have John Carenen as my guest today and showcase his most recent release and the third book in his Thomas O’Shea mystery series, The Face on the Other Side. Sometimes people ask how I got started as a writer. A fair question. I’d have to say in high school, where I was the Sports Editor and Features Editor of THE CLINTONIAN, my high school newspaper in Clinton, Iowa. I was also allowed to write an anonymous satire column, by “Needled.” It was called “In The Groove” and sparked lots of sparks, including from faculty, who wanted me banned. But my faculty sponsor refused to ban me. About that time, I was also taking a Creative Writing course from that same faculty sponsor, who was also a free-lance writer. And still is, with over 100 books published that he authored or co-authored. His support in the school paper brouhaha and encouragement in the Creative Writing class gave me a tremendous boost. And I have to admit the attention I garnered, mostly positive, was also a confidence-booster. It was cool that my peers liked my writing. Now that you know how I got started as a writer, you might wonder what kept me going. I can tell you that it was hard, with many, many rejections ranging from mass-produced to one or two that said, “Try again.” Finally, I sold a humorous piece to Reader’s Digest, and that one sale kept me going for a long time, with further sales to that same magazine, mostly self-effacing humor pieces. But more important than the checks from Reader’s Digest was the encouragement and support from my long-suffering wife, who constantly buoyed me up when I was down after receiving still another rejection. So now I give her the credit. I would have quit a long time ago except for her. Thank you, Lisa! Click here to enter a rafflecopter giveaway for a chance to win a set of signed copies of The Thomas O’Shea Mysteries. John Carenen, a native of Clinton, Iowa, graduated with an M.F.A. in Fiction Writing from the prestigious University of Iowa Writers Workshop and has been writing ever since. His work has appeared numerous times in Reader’s Digest (including a First Person Award), McCall’s, Dynamic Years, and other periodicals. He has been a featured columnist in newspapers in Morganton, North Carolina and Clinton, South Carolina. His fiction has appeared in regional literary magazines. A novel, Son-up, Son-down, was published by the National Institute of Mental Health. He is happily married to (long-suffering) Elisabeth, and they have two grown daughters, Caitlin and Rowe. When he isn’t writing, he thinks about getting in shape, cheers for the Iowa Hawkeyes and Boston Red Sox, and takes frequent naps. He has traveled extensively, having visited 43 states and 23 countries. He is a USAF veteran, having served in the Philippines and Massachusetts. A retired English professor at Newberry College in Newberry, South Carolina, he is hard at work on another novel.